George Adams was born in 1936 in the town of Washington, Pennsylvania. Like many youngsters of that era, George was greatly influenced by the Saturday singing cowboys at the local theatre, Gene Autry in particular. George came from a musical family. His mother played the piano to entertain the family and friends, but did they know she never had a lesson? When George was just six years old (circa 1942), he got up the courage to sing the classic, "You Are My Sunshine" at a friend's house who was using a home disc recorder. His early school years were in a one room schoolhouse. When he was in the second grade, he again found the courage to get up and sing. This time it was in front of three grades / classes and they heard a stirring rendition of "Don't Fence Me In." In the late 1930s, radio was the major form of entertainment for many a home. For George, he made sure he got to listen to the stars he heard every Saturday night over WSM and the Grand Ole Opry or WWVA and the World's Original Jamboree. At that time, he had no inkling that one day in the future he might share the stage and spotlight with the very people that mesmirized him in front of that old "Farnsworth" radio. He got his first guitar when he was five years old. But it was one of those cheap cowboy models. George recalls it was always a challenge to keep it in tune long enough to learn some chords. His early teen years were consumed with the usual boyhood ambitions and dreams of being a professional sports star and music took a back seat to such sports as football, basketball and baseball. When he was a senior in high school, a group of guitar playing friends got together and entered a talent show that was sponsored by the school. George recalls fondly that the group was well received for they got an encore. That appearance seemed to give George the ambition to make an effort towards a career that included music. When he had graduated from high school, George auditioned for a spot on a small Jamboree show that was airing over radio station WEIR in Weirton, West Virginia. He impressed the station management and was given a spot on the show and stayed at the station for the better part of a year while he gained valuable experience and exposure to the radio business. During that time, he was a student of the industry. He took note of the fact that many of the successful artists wrote their own songs and had recordings that the stations could play for their audiences to listen to. George then set out to hone his songwriting skills and also contacting recording companies to try and land a contract. Those efforts paid off in the form of a contract with Blackcrest Records in 1956 that resulted in the release of a record that included two of his own self-penned tunes, "Reckless Heart" and "I Gave My Love To Someone New". The regional success of this effort paid off in the form of a radio show for George and his band over radio station WANB in Waynesburg, Pennsylvania. 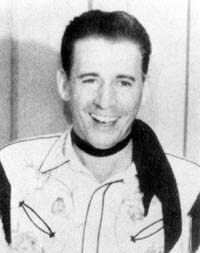 In 1958, George was asked by long-time star of the WWVA Jamboree, Ramblin' Roy Scott to join his Country Harmony Boys band and become a part of that legendary Saturday night show. Roy and his band also did a daily show that was broadcast over radio station WCNG in Canonsburg, Pennsylvania. However, the band was very popular at that time and was doing numerous personal appearances. To ensure that their show would be aired, the band would sometimes record as many as five 30-minutes shows in one night so the station would have something to use in case the band was not able to make it back the next day. George played the bass guitar in Roy's band. He formed a bit of a duet team with another menber of the band, the lead guitarist, Skinney Clark. That gave some variety to the show. The two of them worked so well together that eventually the Jamboree gave them their own spot on the show in 1963. From 1963 to 1971, George and Skinney developed into one of the most popular acts on the famed WWVA Jamboree. Their appearances took them across the Eastern United States and into Canada, going as far north as Nova Scotia. The two of them recorded for several labels and would record songs that George had written. In 1967, they recorded a tune in Columbia's Nashville studios called "The Hurtin' Game" that was released on the Great Records label. It got them national airplay and appeared on many Top 40 charts. During his tenure with WWVA, George was often asked to work with the Jamboree staff band. That allowed him to appear on the show with many major stars that were based in Nashville, Tennessee. 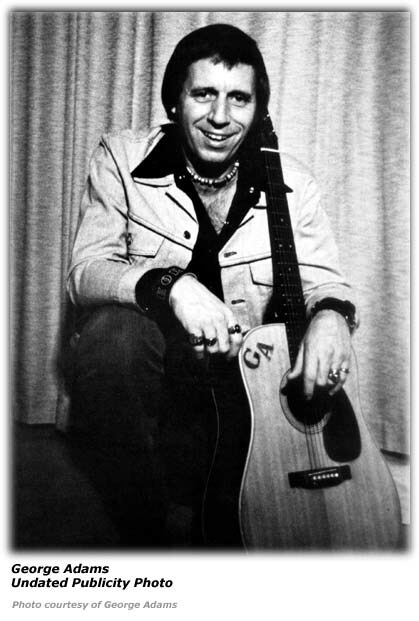 George left WWVA in 1971, but did not leave the music industry. He formed a new band and found work on the night club circuit for many years. Occasionally, George would appear on the various reunion shows on the WWVA Jamboree. George made his last appearance on what was by then called "Jamboree U.S.A." on February 27, 1993. Hillbilly-Music.com wishes to express its appreciation to George Adams for providing biographical information, recording information and photos related to his musical career.